I’m entering baking mode for recipe testing since it has cooled down in the Seattle area. I’m trying save the good stuff for the book, but since it’s raining zucchinis, this recipe for zucchini bread seems timely. 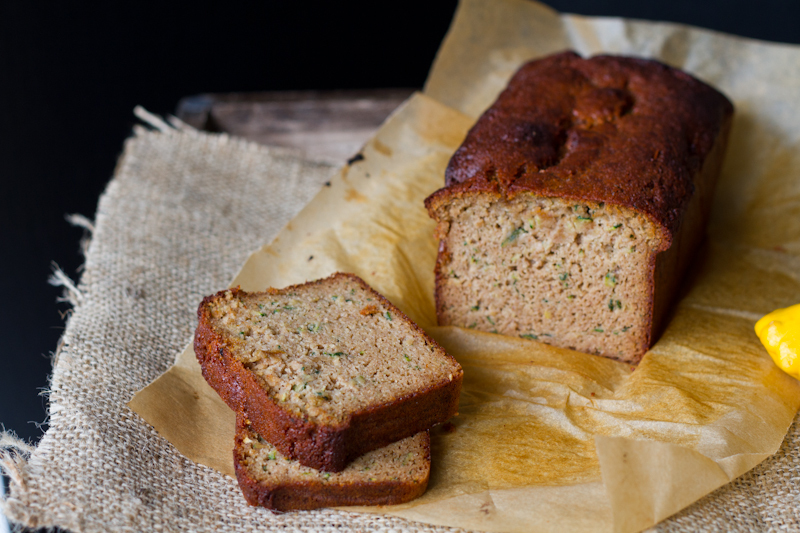 Here’s a moist, subtly sweet bread recipe that will take some of those extra zucchinis sitting on your counter, or garden floor, and put them to good use. Zucchini is one of those standard summer fruits (even though it’s treated like a vegetable), that is taken for granted. No matter though, since it has proven that it is highly versatile. I’m finding it quite useful in several grain-free recipes. The array of shapes and vibrant colors is what really attracts me to summer squash. There are long ones, round ones, crooked-necked ones, patty pans, rondelles, and the undefined shapes. They are yellow and green, striped, and in-between. 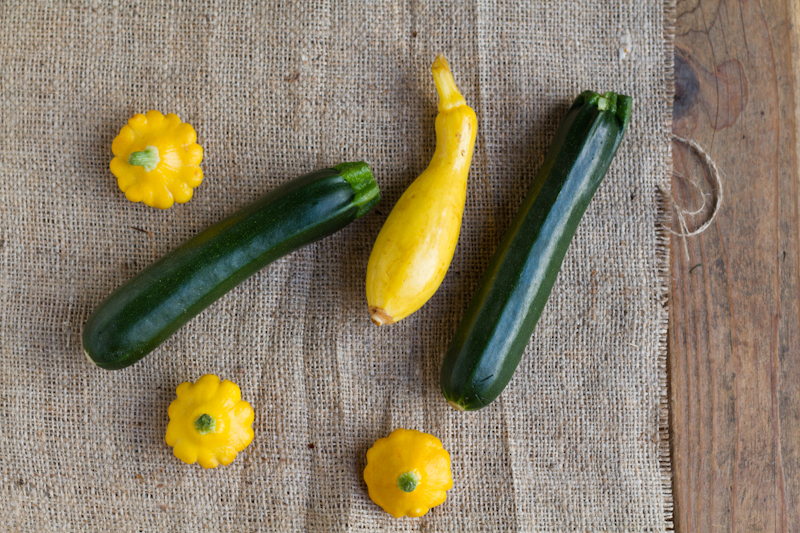 Most summer squash have been cultivated in the Americas, however zucchini was originally cultivated in Italy and elsewhere in Europe and then brought to North America in the early 1900s. While zucchini can grow quite large, the flavor is sweetest when it is picked young, when the seeds are soft, and squash isn’t fibrous. You can tell when they’re ready by their large yellow flowers beginning to bloom, and their delicate spongy flesh. Zucchinis can be stored in the refrigerator in a perforated bag for a week or so. 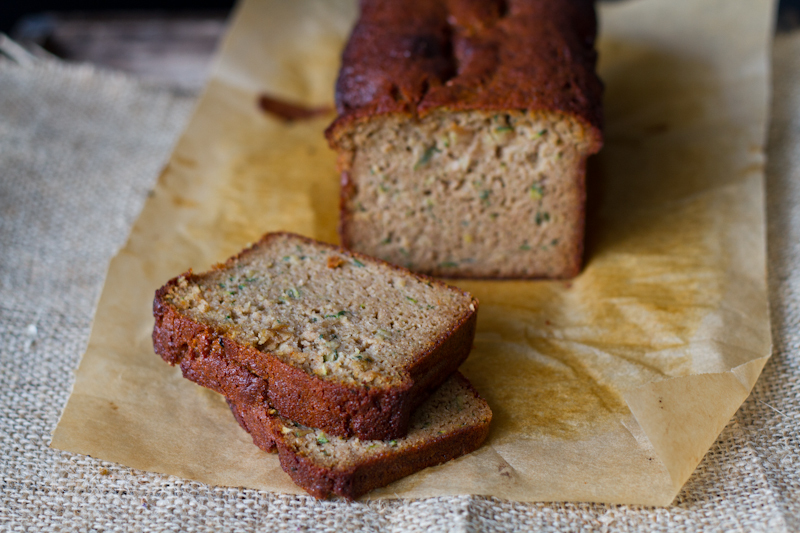 I’m finding this zucchini bread recipe to be the perfect balance of sweetness and moisture. And if you’re interested, try adding some toasted walnuts and dried cranberries (about 1/4 cup) for additional flavors and textures. For the loaf you see in the picture I used a Magic line pan, which is on the small size, so the loaf was bigger than the pan. But it can also fill a 5 inch x 8 inch pan as well. If you want to remove the entire loaf from the pan, I would line it with parchment paper, otherwise, grease or oil the loaf pan. If you’re finding this recipe a bit too moist, reduce the amount of grated zucchini to 1 cup, or place the zucchini in a towel and squeeze it to wring out the excess moisture. Preheat your oven to 350°F/190°C. Combine the almond flour, salt, baking soda, and spices and blend well. Pour the batter into your baking pan, and bake for about 45 to 50 minutes, or until a toothpick inserted in the center of the bread comes out clean. Cool and slice. Store covered at room temperature for a few days, or the refrigerator for a week or so. I haven’t done so yet, but you can probably seal it and freeze it for a few months. I hear you. I don’t know if I would have invested in almond flour while in college. I just did some quick math: 2 cups of almond flour is about 7.2 ounces. A 5 pound bag of almond flour is about $30. So, the cost of almond flour to make this loaf of bread is $2.70. Not that bad. But shelling out $30 seems like a lot. It’s not as bad as I thought it would be though. I like to make my own almond flour, its really simple and costs a lot less. You can get a pound of raw almonds for about 4 bucks. Blanch them, dry and then grind them up in a processor. I prefer doing this because I don’t know how long that almond flour has been sitting on a shelf and chances are its already starting to go rancid. It’s the blanching part that stops me in my tracks. the blanching is so easy! it takes literally one minute having them in the hot water then transfer to ice water. The skins come right off. Thirteen dollars at Sam’s Club for 3 lbs of Bob’s Red Mill super fine almond flour. Like Pete we make our own almond flour, but use the leftover pulp from making almond milk. We first dry the pulp on a cookie sheet in the oven, then whirl it in a food processor to get a flour consistency because the pulp is more like almond meal. So you get double the goodness from one cup of almonds – a quart of almond milk plus about a cup and a half of almond flour. I grind my own almond flour with a coffee grinder. Trader Joes or Vitamin Cottage have reasonably priced almonds. Buy it at Costco. Very reasonable. Large bag for $11. This sounds so delicious and easy! Part of me wants to jump into fall recipes, but another part of me can’t give up my summer produce quite yet! Excellent! I’ve been craving a nice slice of zucchini bread lately. oh good :). I just gave a loaf to an elderly neighbor, who was in heaven. I never knew it but she said she has always been grain-free! And she has 14 grandchildren and has baked with almond flour for 30 years! I would imagine that your neighbour has a TON of killer recipes….I would go to the source and ask for as many as possible. Perhaps you could even get her to compose a cookbook as a legacy! I love all of your recipes, but I had trouble with this one! Any ideas why this may have happened?? I knew this might be tricky depending on how you measure stuff and your oven setting. For the zucchini, I don’t pack it down – it’s a “light” 2 cups, but try going down to 1 1/2 cups. And dry the zucchini off with a paper towel to get rid of some moisture. Also, I use the convection setting in my oven a lot to speed things up. So it might take a bit longer to bake at a regular oven setting. but it should be longer than another 10 minutes. I just made this bread this weekend and used coconut oil instead of olive or butter. It is amazing. I will agree that it took a lot longer than the recipe says in the regular oven. At 40 minutes, it was still very loose in the middle. I took it out and put it into my convection toaster oven and 20 minutes later it was done. I would perhaps try it again in a regular oven and see how long it actually takes. I have had several of the baking recipes take longer in a regular oven. Fantastic recipe, very yummy! Thanks Dani! Yes, I just adjusted the time (I tend to use the convection setting). Made this and it was great! Not too zucchini-y for the kids. Great texture for a gluten-free bread. Thanks for posting! This was amazing! Very moist and the spices were great. I’m thinking of swapping out the zucchini next time for carrots. Seems like it would be a good fit with these spices as well. Thanks! Carrots, interesting. Let us know how it turns out. wow, 1 hour 20 minutes. You may be able to bake at a slightly higher temperature (depending on your oven). Was it burnt on the outside? If you try this without oil, let us know how it turns out. I’m tempted but I don’t have zuchinis at the moment. One more thought: it’s possible that the applesauce is providing too much moisture. Do you happen to know of the carbohydrate count per serving or an easy way to figure that out? Can this be made without sweeteners like honey? i”m diabetic and don’t want to use the sweetener. I haven’t tried it (yet) but I bet it could because it’s very moist. You’ll need to account for most of the lost liquid if you use Stevia. Another option is to replace with dates; 1/4 cup of honey is about 1/4 cup of chopped dates. How many servings would you estimate in a loaf (the sparkpeople calculator requires # of servings when you put in the recipe. Help! this calculator insists on having the almond flour in grams! And other ingredients maybe too. There are U.S. to metric calculators on Google and vice versa. Just do a search on Google. I made this yesterday, my first try using almond flour, but I didnt get the “rise”. Your picture looks nothing like mine. Though it cane out delicious and moist, it was kinda dense. Any ideas on what I did wrong? It’s not a light bread if that’s what you’re looking for. It should rise though. Did you leave out baking soda? Hi Erica, I did use the amount of baking soda that the recipe called for, (I remember useing the 1/2 teaspoon for both the sea salt and baking soda) I even went back and checked the expiration date on the box (2016)..it was a new box. I wasnt expecting a “fluffy” bread…but I did expect it to rise higher than the height of the poured batter before it went into the oven! It’s not too soggy, the zucchini was drained/patted dry after grating. I used a 5×8 pan and added some chopped nuts, that is the only difference that I can see. hmmm. it shouldn’t be too dense, just moist and a bit heavier than a cake – sort of like the banana bread. If it’s just low, then that would explain it’s appearance, but other than that I’m not sure. sorry! Has anyone tried making this without the eggs? Would flax meal work? I have egg replacers mix but am nervous about using it. I tried using it when making the Simple Yellow Cake recipe and it was a disaster! lol! Erica, this is absolutely amazing! I actually made two versions of the recipe (my son has dozens of food allergies, so his version had a combo of buckwheat-quinoa-brown-rice flour; and then a batch for my hubs and me with almond and quinoa flour, as well as coconut oil). My husband and I devoured most of our batch last night, and now we’re finishing the last two pieces for breakfast. 😉 This is marvelously moist and perfectly sweet. Thank you for such a keeper!!! Wow, glad this recipe can stand up to multiple variations! This looks devine! Wondering if I could sub the almond flour with coconut flour and add some coconut flakes for more of a zucchini “cake”? Thanks for the recipe, definitely going to try it out! ! The ratios using coconut flour would be different, so it would most likely not work out. Ah, thanks for the heads up! I will stick to the original recipe then. Thanks. I did make and have now eaten this zucchini bread. I followed your recipe to a T and it was perfect, delicious and I am so excited to keep making it! Oh, I ran out of honey and used some agave to make up.. The spice ratio is also perfect for me, I wasn’t looking for a spice cake taste and this combo / amount was perfect to add flavor without overpowering. I did use 11/2 loose packed cups of zucchini that I laid between paper towels and even pressed a bit before mixing in – I cook a lot and recall how you need the moisture to come out of things like eggplant for recipes to work.. Lastly I baked at 350 in regular oven for 60 minutes exactly, came out golden brown all around. Look forward to using more of your recipes!! Thanks again!! probably but I haven’t tried. Wrap/seal it well. I loved this recipe! I used 1-1/2 cups ground almond flour with 1/4 cup white rice flour. I also used a scant 1/2 cup of honey with 1/8 cup of dark molasses. Absolutely amazing flavor, and I’ll definitely bookmark your site to visit often. It’s hard to find great recipes when trying to avoid wheat flour, but this bread recipe beats my “wheat” recipe hands-down. Thanks for this great recipe! I am sampling it directly off my cooling rack, and it tastes awesome! Nice! Love the variation in the size so you cut small square-like cake pieces. Super yummy! Made it today and had a slice of it warm! So good! Thanks for the great recipe! I am so happy to find a zucchini recipe w/o wheat flour. I am trying to get away from it. I will try this tonight for our camping vacation during the week. Can’t wait!! I made this to accommodate my need for a lower carb baked good (for blood sugar control). Instead of honey I used 1/2 cup swerve, and added 2-4T water to the batter. I also used ghee. I cooked it in 2 mini loaf pans for 50 min, at 350. DELICIOUS!! So glad this worked for you. Good to know! I’m curious about swerve so thanks for sharing this change-up. I made this recipe for my daughter. She loved it. She has not had zuccini bread for 2 1/2 years. I used the maple syrup instead of honey and added 2 tsp vanilla. From all the comments that I read, I squeezed the water out of the zucchini. I also made muffins and sprinkled raw pumpkin seeds on top of half of them. The muffins baked in 24 minutes and were very moist inside. Going to try banana nut breas/muffins mext. Great recipe. Thanks! good to hear! Love the addition of pumpkin seeds! This was delicious! My husband and I are on GAPS and this fits perfectly! I wrung out my zucchini and only used 1/4 cup of honey. PERFECT! I only needed about 40-45 mins or so, but I’m at high altitude which might have made a difference? THANK YOU! I’m trying to save the piece I brought to work with me but that’s going to be really hard….! Delicious. I doubled the batch and added some cardamom. Half the batch went into a loaf topped with walnuts, the other I added a teaspoon of Hershey dark coco powder and a handful of chocolate chips. It was amazing! Also reduced honey to 1/3 vs 1/2. This zucchini bread looks great. I was wondering if you could substitute cashew flour for the almond and still get good results. I have lots of cashew flour and was looking to use. yes, in general, you can swap nut flours. I haven’t tried it, but I bet it will taste only slightly different due to the subtle flavor difference between the two flours. This might sound like a silly question but what do you mean by blend? Use a food processor or use beater? I don’t know what I did wrong, but this did not turn out for me at all. The mixture did not make a batter at all. It was very dry and crumbly. Not nearly enough liquid in the mix. What brand of almond flour do you use in your recipes? 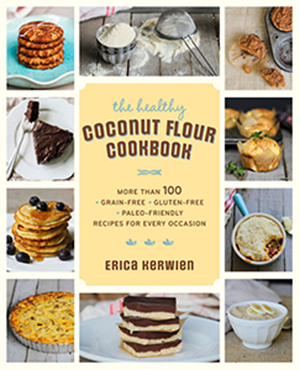 Same question re coconut flour? I find that the textures/absorption rates between brands can vary a lot so I’d like to be successful on first try. Thanks! Servings: 8; Calories: 311; Fat: 22 g; Carb 24 g ; Fiber 3 g; Protein 8 g; Sugar 19 g; Sodium 245 mg; Cholesterol 47 mg. The 19 grams of sugar – is it a total 19 grams for the entire loaf, OR is it 19 grams per one of those 8-slice servings? The stats are for one serving, or one slice. I have to say though, I’m going to remove the nutritional info because I’m finding it inconsistent. I was using a program that the NYTimes uses but I’ve had some readers say it’s not accurate. Without a way to check, I’m not going to include this info any longer. thanks for asking! I LOVE this recipe. I made it a couple weeks ago and my husband is not willing to do the Paleo or Wheat Belly way of eating. I ate this whole loaf all by myself and didn’t have to feel guilty one bit. I added a couple other ingredients, chopped walnuts, orange zest, vanilla, dark cocoa powder and chia seeds. I’m sure its great without those ingredients, but its REALLY good. Great additions! Yes, this can be very basic, or dressed up. Thanks for sharing your fave! Have you tried making this with the addition of crushed pineapple? How much would you add and would you have to have more flour? Great idea – I haven’t but I would drain the fruit of all or most juice; I guess you could add a bit more flour but not much – or try a teaspoon of coconut flour if you like it. Yumm!!!! I made this into muffins and the cooked up in 30 min. I also was short on zucchini (had about 3/4 cup) so I added a couple small shredded carrots. Great recipe! Definitely will make these again!! It’s hard and I haven’t tested it, but possibly bananas or apple sauce might work. Best of luck! Thanks 🙂 Yes to carrots and chocolate! The mixture is more like cookie dough than batter. The shredded zucchini was drained very well, could that be why? Hmmm. Possibly. Did you bake it? again and bake longer because it was a little too moist, but was still delicious. Worked well as muffins also. Can always count on you for great recipes❣️Had tried a different recipe and it was not a success. Thanks, Michelle! yes, sometimes it just takes a bit longer to firm the center. Can u use splinda instead of honey? Great to know it freezes well as mini loaves! I don’t list them, but you can find out online. Try http://www.myfitnesspal.com, or nutritiondata.self.com. I made this recipe today as I have recently had to use the SCD diet. As others have said, it is a very dense recipe and actually took less time in my oven then the specified time. I took it out just as the edges were blackening. (for me the time would probably be adjusted to 40 to 45 minutes). It is yummy but I had imagined the Zucchini Bread from my childhood. Don’t get me wrong, still yummy, but I guess I need to get away from the image in my head of bread made with regular flour. This is the first bread I have tried with Almond Flour. Also thinking maybe using a little less flour next time as the mix was quite solid even when putting it into the loaf pan. I adjusted the time again, but it will vary based on the moisture from the zucchini. Almond flour can be denser and this is a dense bread for sure. You might want to try some of the muffin recipes, which are lighter, and maybe coconut flour, which does make lighter baked goods. Thanks for the feedback! Very weird. I would check your measurements. looks like a really good recpe. Has anyone tired adding raisins or dried cranberries? How about boiled cider instead of honey/maple syrup? This bread failed for me. 🙁 it was totally concave in he middle and never cooked all the way through even though I left it in for at least 15 min longer than the recipe said. The only thing I can think of is hat I doubled the recipe and split it between two loaf pans. I also used flax eggs instead of eggs. Any ideas? The flavor was still good but I had to toss it. Flax eggs don’t work for me beyond 2 eggs, so that might have been why. I baked this and based on other reviews, left it in the oven for 65 minutes. I used a toothpick to test doneness and since it came out clean, took it out of the oven. It was still a bit undercooked in the center but still held together and was delicious! I added dried cranberries and pecans for extra flavor and visual appeal, Next time I’ll bake another 10 minutes. Thanks, Dana! The more moist it is, the longer it will take. I tend to use the convection setting on my oven for heavy breads, but yes it may take longer.